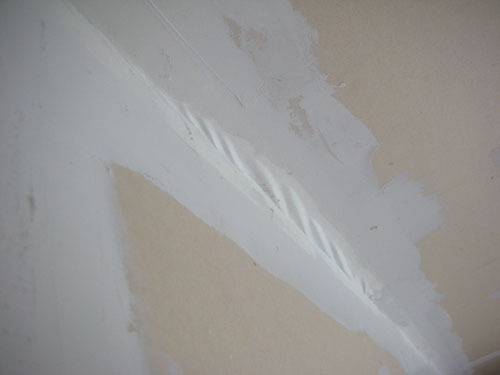 I spent much of my house-work time yesterday ripping down the wrinkled drywall tape. It's startlingly easy to do: just grab hold of an end and tug, and the tape pulls free, crumbling the dried mud off. 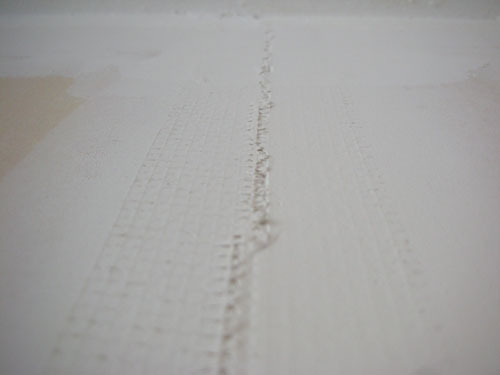 Where the tape wrinkled, I removed it so that I could repair sections like this: the house has shifted (from the foundation work). You can't resolve a problem like that sort of wrinkle. Surprisingly, not all the corners had wrinkled. I ended up removing tape from two of the edges where the wall meets the ceiling, and from three of the corners of the room. Of course, the bay had not been taped at all, and that would have been a total mess; that kind of structure always moves a lot when the house shifts. Corners are kind of pain; I'm not looking forward to doing the bay. In a way I'm glad we had to postpone the demo party; it gives me more time to procrastinate on this work. It's not all suffering, of course. I will also need to patch up areas where I used mesh (I use tape for corners and mesh for flat joins), and the mesh has been stretched and cracked. For the most part the mesh can be left in place; I just need to apply mud over the top to fill in holes where the mud popped out. That's super-easy. I started re-taping the corners yesterday, but the mud I have has gotten too dry to be workable, and accordingly it did not work. So it's time for another trip to the store to get more mud. I'm thinking I will get a 5-gallon bucket, because we will have this room, repairs to the back parlour, and the dining room and hallway to patch up all in the next few months. Also, I would like another 5-gallon bucket and cannot bring myself to buy one with a store's logo on it (I refuse to pay to advertise for a corporation). You really should try using mix-it-yourself mud. So much better than the premixed cause it drys way faster!! It also shrinks waaaay less you can glop more on at once. You can easily do 2-3 coats in a day as opposed to waiting what 24hrs inbetween coats with the premixed stuff. Its not that hard to work with once you get the hang of it. I've been nervous about using the dry stuff because I work really slowly. I like having a long time to futz around with the tape or whatever, and since I usually only have time to do one coat in a day, anyway, not being able to do it all at once doesn't bother me. But maybe I will pick some up this time and see how it works. Certainly it would store better. I'm kind of tired of throwing away half-used blocks of mud because they dry up. I completely agree about buying buckets with a logo. If they want to advertise that way, then the buckets should be free.